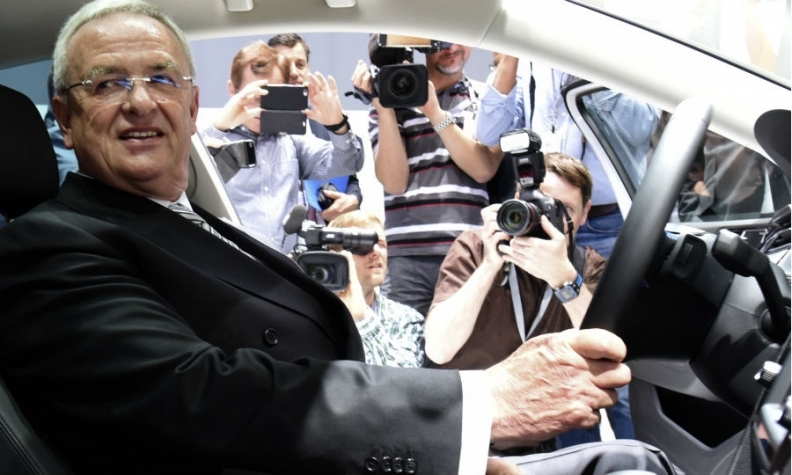 Volkswagen CEO Martin Winterkorn poses inside a car before the automaker's annual meeting. HANOVER, Germany (Reuters) -- Volkswagen's leadership will meet next month to discuss a new leadership structure as the automaker seeks to return its focus to business following the shock ouster of former patriarch Ferdinand Piech. VW will hold a special meeting in June to discuss further changes to its leadership structure, such as possibly aligning individual brands more closely, a supervisory board member told Reuters today. VW CEO Martin Winterkorn, who survived the public showdown that triggered Piech's resignation last month, told shareholders earlier today that the company will tackle the trouble spots that Piech complained about in provoking the leadership crisis. "It is good that we have returned to calmer waters and that we have clarity about our future direction," Winterkorn said at VW's annual shareholder meeting here. "We cannot and must not stand still." VW is cutting costs at its namesake car brand in a bid to improve profitability, while also battling to revive its fortunes in North America and build a trucks business to challenge sector leader Daimler. Piech did not attend the shareholder meeting for the first time in more than two decades. He retains a stake in VW and has clashed with the group about board appointments since his departure. Winterkorn said the supervisory board's steering committee and board members were working hard to swiftly find a replacement for former IG Metall union chief Berthold Huber, who is acting as interim chairman. Huber said the board will not rush to find a successor to Piech. "The supervisory board will address the succession of Piech with the necessary diligence and calm," he said. "This will take some time." Separately, Winterkorn said VW currently has no M&A projects on its agenda and is "well positioned" with its 12 brands. Ulrich Hocker of Germany's DSW association of private investors was keen for VW to move on. "It's a disaster that's hurting the company," he said. While hailing Piech's accomplishments, he condemned his public criticisms of Winterkorn as "terribly unprofessional." VW shares have fallen about 8 percent since the crisis broke. In a bid to address a long-standing criticism of its setup, VW announced the creation of a truck holding company to combine its heavy-duty commercial vehicle brands MAN and Scania, aiming to boost synergies between them. Winterkorn paid tribute to Piech. "The group and its people have much to thank Piech for," he said. "We and I have tremendous respect for his lifetime achievement." Piech's vision of creating an all-encompassing automotive group ranging from motorcycles and small city cars to 40-ton trucks was in full display at the Hanover exhibition center where almost 3,000 VW shareholders gathered. The acrimonious power struggle with Winterkorn that led to Piech's departure will probably cast a cloud over the world's second-biggest carmaker far beyond today's meeting. The 78-year-old grandson of VW Beetle creator Ferdinand Porsche still exerts influence behind the scenes. Piech complained before the meeting that the family members replacing him and his wife on the board don't have enough automotive experience, Germany's Bild newspaper reported. The criticism shows how hard it will be to find a new chairman who pleases the factions of the Porsche-Piech clan that controls the carmaker, as well as labor leaders and shareholders Lower Saxony and Qatar. Given Piech's legacy and his position within the family, "it's important to find a face-saving solution, and that's not very easy," said Frank Biller, an analyst with LBBW in Stuttgart, Germany. "It's a deadlock to an extent." The VW patriarch's nieces, Louise Kiesling and Julia Kuhn-Piech, will replace him and his wife, Ursula Piech, on the board. The Porsche-Piech family occupies half the 10 seats on the investor side of VW's board and controls 50.7 percent of the voting shares. The investor side of the board represents shareholders, while the other half of the supervisory board is made up of worker representatives. Piech also still has a seat on the board of the clan's investment vehicle, Porsche Automobil Holding SE. Piech started the fight on April 10 by telling German magazine Der Spiegel that he was keeping his distance from Winterkorn. The shareholding families, labor and political leaders quickly rallied to support the CEO, delivering Piech a rare boardroom defeat. Even after the initial pushback, he continued to pursue the ouster of his former confidant. That led to his resignation. Winterkorn has helped lead VW to within a short distance of Toyota Motor Corp.'s place atop the global car market based on global vehicle sales. Piech's cousin, Wolfgang Porsche, and other board leaders said on April 17 that they plan to extend Winterkorn's CEO contract after his current term ends next year. In Germany, top executives' contracts are generally only extended in their final year. Before the shareholders meeting started, Winterkorn toured an exhibit of VW vehicles in a hall next door, trailed by an inner circle that included Lower Saxony Prime Minister Stephan Weil, Wolfgang Porsche, as well as Piech's brother, Hans-Michel Piech, and other family members. Surrounded by a pack of reporters, they looked at a gray Skoda, the chassis of the latest Seat Leon model and a blue Lamborghini Asterion hybrid. When they reached the Porsche exhibit, brand chief Matthias Mueller, whom Piech had pushed as a possible successor for Winterkorn, showed the top brass a white 918 Spyder plug-in hybrid race car and then looked around for the new supervisory board members. "Where's Mrs. Kuhn-Piech?" Mueller said, then walked over to a white Panamera S E-hybrid, which VW's latest power player wanted to check out.